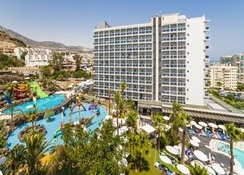 Enjoy a fun filled holiday by booking the stunning 4* Globales Los Patos Park in the residential area of Benalmadena-Costa. The Globales Los Patos Park is surrounded by mature gardens, offering a bright and comfortable atmosphere and impressive accommodation. 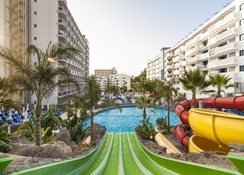 A short walk from the hotel guests will find a great selection of shops, restaurants and bars, or for a little more night life, a 5 minute bus journey will take them to the heart of the resort or a little further to Torremolinos. The beach is only 200 metres from the hotel and for those golfers the 'Torrequebrada Golf Course' is only 1 kilometre from the hotel. 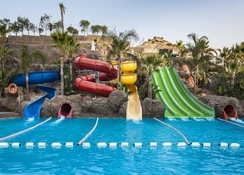 Malaga Airport is 8 kilometres away from the Globales Los Patos Park. 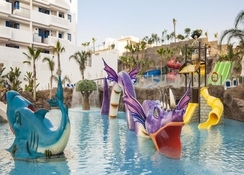 All year round the Globales Los Patos Park offers an extensive programme of activities and entertainment throughout the day and evening, allowing guests to participate as much or as little as they please. Food, Drink and Entertainment: Restaurant, Poolside Bar, Lounge, Shop. 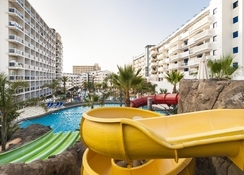 Sports, Games and Activities: Swimming Pool, heated pool in the winter, Children's Pool and Children's Play Area. 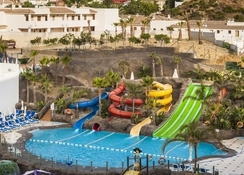 For the Kids: Children's Swimming Pool, Playground. Mini club during the high season. Additional: Laundry Services, Reception with Currency Exchange, Parking, Internet wi fi in hall and salon and Internet point (local charge). Please note the maximum capacity is 2 adults and 2 children Or 3 adults. Rooms were clean and hotel was no more than a 2 minute walk to the beach. The pools were fun and kept an 11 year old happy with the flumes. Great half board and fully inclusive facilities. The food was outstanding and varied each night. We would go again. Amazing place, food was really nice and fresh so much choice for everyone. They have four pool so kids had brilliant time. Every nite different programme and they were simply superb. They have good parking facility. View was really amazed. I can go there lietarly every one. Your every penny worth. We had an amazing time at this hotel with our 3 year old and definitely will return. A very good all inclusive, most drinks included, great quality & choice of food. Staff were friendly & the water slides were a big hit! The hotel is amazing and its staff are very friendly and helpful. The rooms aren’t big enough for a family of four hence the reason why I gave it 4 star. The location of the hotel is perfect for everything. Strongly recommend Los Patos. Facilities very clean throughout. Food well presented and tasty. Entertainment for kids amazing. Close to local amenities and attractions.